Whew! The last couple of weeks have been such a whirlwind. I couldn’t talk about this on here until now, but I’ve just spent the last week in Las Vegas! The trip was a surprise for my sister Tia’s 25th birthday and we have been planning it secretly for months. I have an update coming later this week when I’ll tell you all about it! 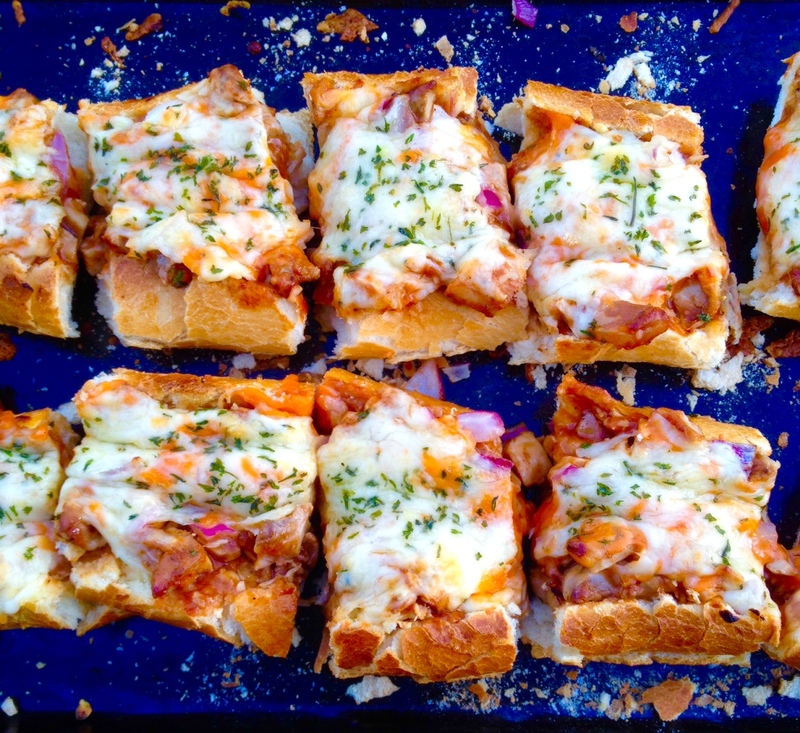 Until then, let me introduce you to this French bread pizza that I made before we left and can’t stop thinking about. I’m really into making my own pizza dough and pizza night becomes a weekly occurrence in our house this time of year (especially now that I’m allowed to use my oven again after the summer ban). Recently, with all of the craziness of Thanksgiving and Vegas trip prep, I got a little lazy and decided to throw some pizza toppings on a beautiful, crusty loaf of bread. Now, hear me out. I know French bread pizzas aren’t a new thing by any stretch. I’d been seeing some version or another all over the internet for years and never understood what could be so great about them. I’ve been proven wrong, my friends. I’m now totally obsessed. For starters, I brushed my loaves with garlic butter to add an extra layer of flavor to the bread. Then I spread on some saucy barbecue chicken (heavy on the sauce, just the way we like it). I sprinkled on some red onions for even more flavor and then topped it all off with a blanket of two cheeses. The textures are ridiculously satisfying. When baked, the bread gets crisp and crunchy on the outside but stays chewy and soft on the inside. 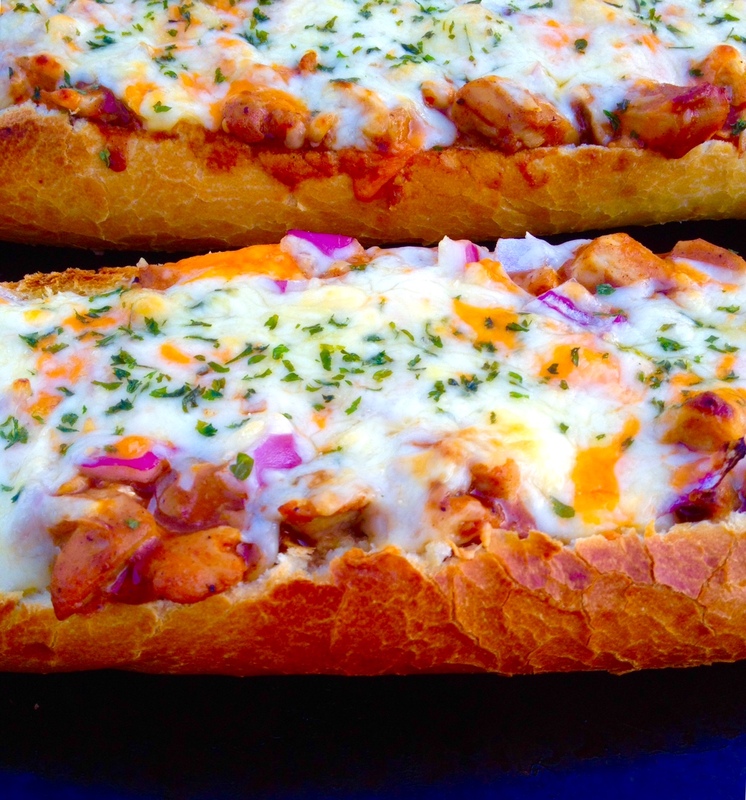 The saucy chicken and gooey cheese melt altogether onto the garlicky bread for a total flavor explosion. If you cook your chicken beforehand like I did, these come together really quickly too. I had them in the oven after ten minutes of prep and they only bake for twelve more which means you get the new meal of your dreams in less than half an hour. I may never make real pizza dough again. Cut the loaf of bread in half and place on a large cookie sheet. Melt together the butter and garlic cloves and brush each half of the loaf with the garlic butter mixture. Cut your cooked chicken into small pieces and toss with the barbecue sauce. Spread the saucy chicken evenly over the loaves. Sprinkle each loaf with the diced red onion, then layer both kinds of cheese evenly. Sprinkle on a bit of parsley if desired. Bake for 10 minutes and then broil for 2 minutes. Once cheese is bubbly and golden, remove from the oven. Wait a few minutes for them to cool, then slice and devour. I used a garlic barbecue sauce and thought it worked great, but the flavor is entirely up to you. To cook my chicken thighs, I tossed them with 1 tbsp. brown sugar, ¼ cup barbecue sauce, salt and pepper and baked for 30 minutes at 400 degrees. Once cooled, I refrigerated them overnight to make the French breads the next day. You could use your slow cooker or a cooked rotisserie chicken to make this even easier!